Charleroi Je zde 1 položka. "Charle-Roy In der Grafschafft Namur". 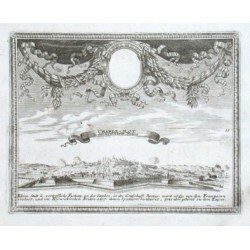 Copper-engraving by G. Bodenehr (1664-1758), ca. 1720. With great ornamental border with coat-of-arms (not filled out) and explanatory notes below the picture. 15:19,5 cm.